Samsung has yet to officially unveil the Galaxy S4 mini (perhaps on June 20?) but the leaks are getting more detailed so we have a pretty good picture of what to expect. 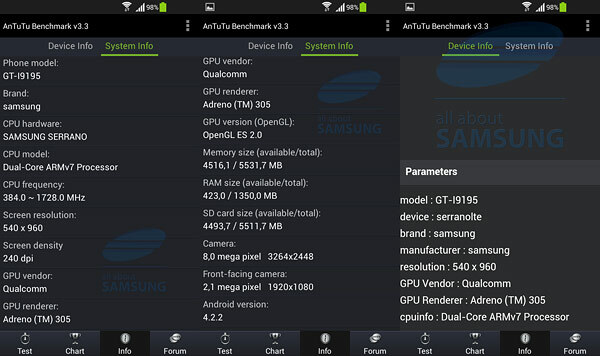 The latest leak shows AnTuTu's info screens, which detail all the specs the benchmark managed to detect. The Samsung Galaxy S4 mini, model number I9195, has a screen (reportedly Super AMOLED) with qHD resolution and 240ppi, which doesn’t match the rumored 4.3" screen diagonal, but it's not uncommon for an app to report the wrong pixel density (4.3" screen with qHD resolution should have 256ppi). The phone runs Android 4.2.2 on a Snapdragon 400 chipset – dual-core Krait 200 at 1.7GHz, 1.5GB RAM and Adreno 305, the same chipset found in the Samsung Galaxy Mega 6.3. The available internal storage is listed as 5GB, so it should be 8GB in total. AnTuTu also listed the two cameras – 8MP main camera and a 2.1MP front-facing camera. This matches what we've heard about the Galaxy S4 mini so far. Note that there should be four versions of the S4 mini – this one, the I9195 with LTE support, a I9150 model with Exynos 5 chipset (dual-core Cortex-A15 @ 1.6GHz), a I9192 dual-SIM, and the I9198 for the Chinese market. Any leak or ideas on the final price? the screen is probably 4.58"